Roanoke Backflow Testing laws are in accordance with federal laws and the laws in the State of Texas, stating that all potable water sources must be protected to prevent contamination including any cross-contamination of water sources. 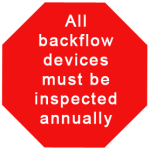 This simply means that all back flow prevention devices are required to be installed in every water source system and that they be inspected annually to insure proper working condition. This backflow testing must be done by a state-licensed backflow prevention tester. City Backflow Testing holds all necessary licenses and certifications for affordable backflow device testing, maintenance and installation in the City of Roanoke, Texas.